LAWRENCE - For the second time in less than a month, KU Law’s moot court competitors traveled to Denver and brought home honors for the Jayhawks. Ashley Akers, 1L, was named the fifth-best orator at the regional Philip C. Jessup International Law Moot Court Competition, outranking more than 80 competitors. The Jayhawks’ 50 percent record was not enough to advance out of the preliminary rounds, but it was enough for Akers to impress the judges, “a welcome success that reflected well on all team members,” said John Head, Robert W. Wagstaff Distinguished Professor and the team’s coach. Twenty-one teams competed in the event, including Vanderbilt, Stanford, Arizona and Minnesota. Currently in its 55th year, Jessup is the world’s largest and most prestigious moot court program with participants from more than 550 law schools and 80 countries. Competitors participate in a fictional dispute between countries, preparing oral and written arguments for both sides. Earlier this year, KU Law students brought home the first-place trophy for their written brief at the Stetson International Environmental Law Moot Court Competition in Denver. 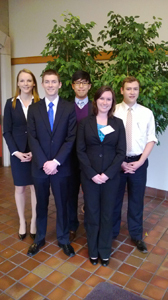 KU’s top moot court competitors represent the university at national and international competitions. Clinical Associate Professor Pam Keller oversees the program.